On 08-Oct-2017, a competition on the occasion of "Sister Nivedita's" 150th birth anniversaries (1867 to 2017) was held at the Sibasagar Girls College Auditorium in collaboration with the NCC & NSS wings of the college in two different categories of Power Point Presentation & Wall Magazines competition on the topic of Sister Nivedita's work & services for the people of India & world as a whole. The competition was organised by the Vivekananda Kendra, Sivasagar Sakha, Assam, India. The competition started at 10.30 am and concluded at 4.30 pm. Many schools and colleges were a part of that competition and featured their innovative ideas and creativity in front of the respected judges. There were 4 judges in the chair to evaluate the whole competition and they were namely 1) Dr. Rajiv Baruah (Member, VKV-Sivasagar Managing Committee) 2) Shri Dambhedar Tai (Member, Vivekananda Rock Memorial) 3) Smt. Bunty Bhuyan (Principal, KVM School,, Joysagar & coordinator VK, Gaurisagar) 4) Smt. Eva Goswami (Saha Nagar Pramukh, Vkendra, Sivasagar). Among all the dignitaries the Principal Shri Poresh Ch. Loying, VKV-Sivasagar & in charge Shri Ratul Kalita (Amolapatty VKV-Sivasagar) were also present on this occasion. 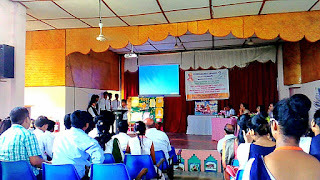 In Power Point Presentation 1) Dikhowmukh College 2) Demow College begged the 1st & 2nd position respectively in the category. The position secured in the Wall Magazine category were 1) Demow College 2) Gaurisagar H.S. School & 3) Demow College as 1st, 2nd & 3rd position holder respectively. Shri Vishwas Lapalkar, lifeworker of Vivekananda Kendra, delivered a talk on Swami Vivekananda and Sister Nivedita. In the concluding function prizes and certificates were distributed to the participants.